TrendMD’s simple pricing model ensures that for every US $1 spent with TrendMD, a publisher will receive at least one new visitor from outside their own network. 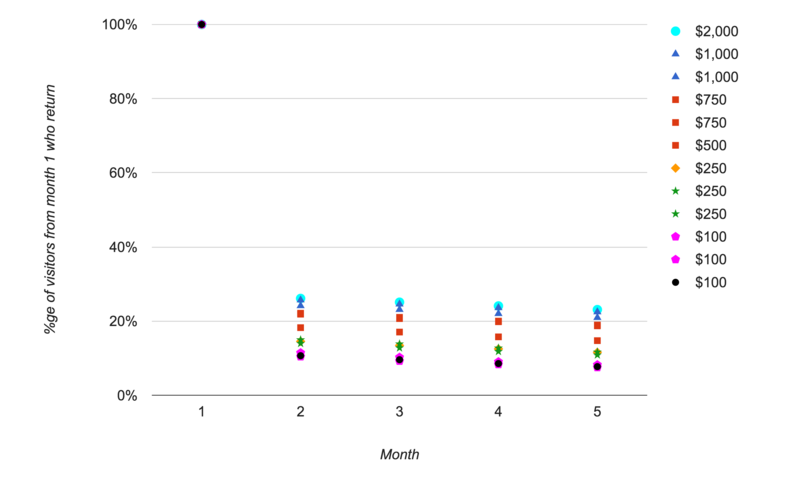 We measured the effects of TrendMD on article views per month across 12 journals, each with different marketing spends. The trend was clear: more spend = more readership. However, that is not the only part of the story. Once these new visitors arrive, a substantial fraction of them will explore and discover more articles on the publisher’s site, and can be expected to return at a later date. This is illustrated in the graph below, which shows how the traffic excluding usage by visitors sent via the TrendMD network (which we refer to as the 'organic' views) increase over time. Notably, the higher the marketing spend, the greater the rise in 'organic' article views seen. 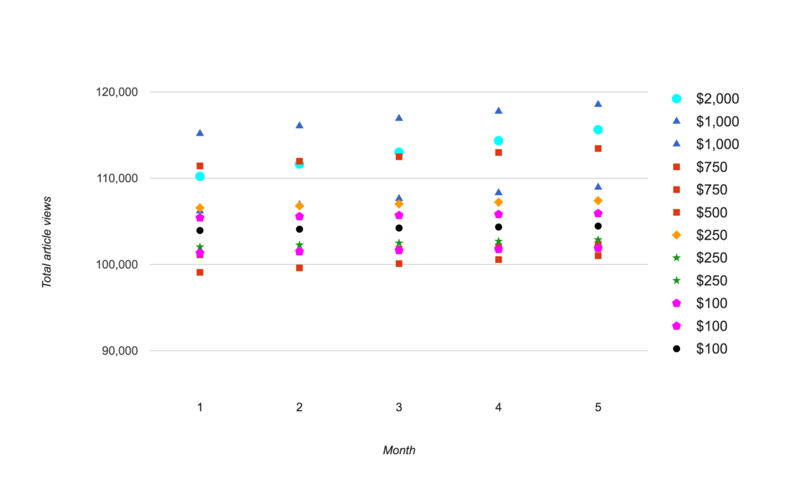 The graph below shows data for 12 publishers on the TrendMD network, ranked according to their monthly marketing spend, and looks at the fraction of users which return to the site in each month following the first month of a 5 month trial period. It can clearly be seen that larger marketing spends delivery a higher percentage visitor retention, and we can use this to build a quantitative model for the effect of different marketing budgets on overall usage levels. To create and visualize this model, we consider a ‘standard website’ with 100,000 article page views per month as an organic level of usage at the beginning of the period. 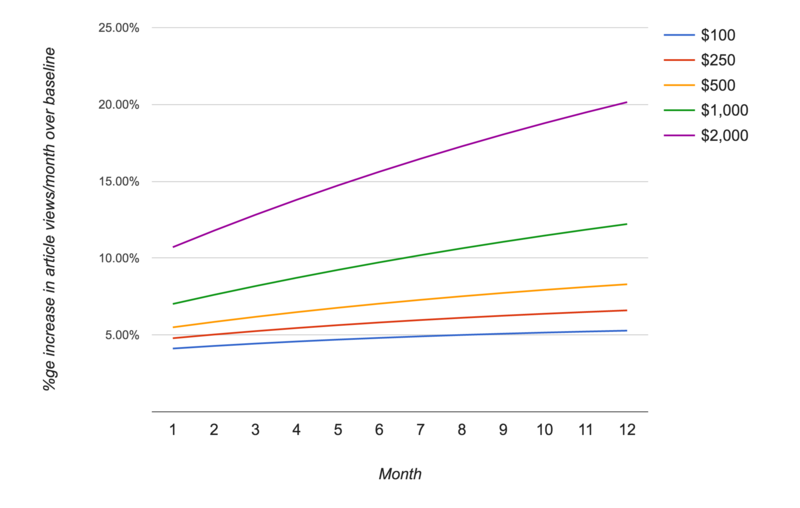 By plugging in the mean retention values seen at different levels of monthly marketing spend, we see the following predicted results in terms of the boost in readership, for this ‘standard website’, at different levels of monthly marketing spend. (2) Higher marketing spends lead to a proportionately lower cost for each additional access. i.e. increasing returns. This follows from the model because there is a positive correlation between the number of additional visitors acquired (driven by marketing budget) and the percentage retention of these new visitors. 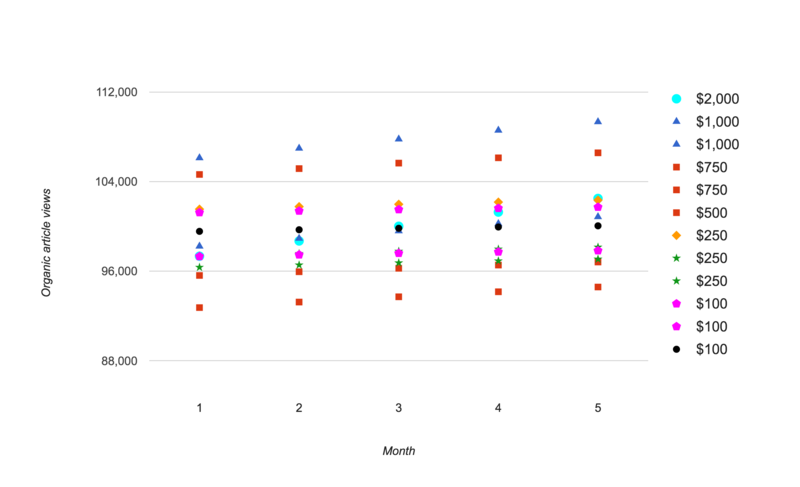 For example, for publishers spending $1K-$2K/month, we recorded the percentage retention at over 20%, but at lower spends ($100/month) the percentage retention was also substantially lower (~8-10%). TrendMD also offers volume discounts; higher monthly spend = lower cost per visitor. This yields even higher percent increases in readership for journals on the TrendMD platform. 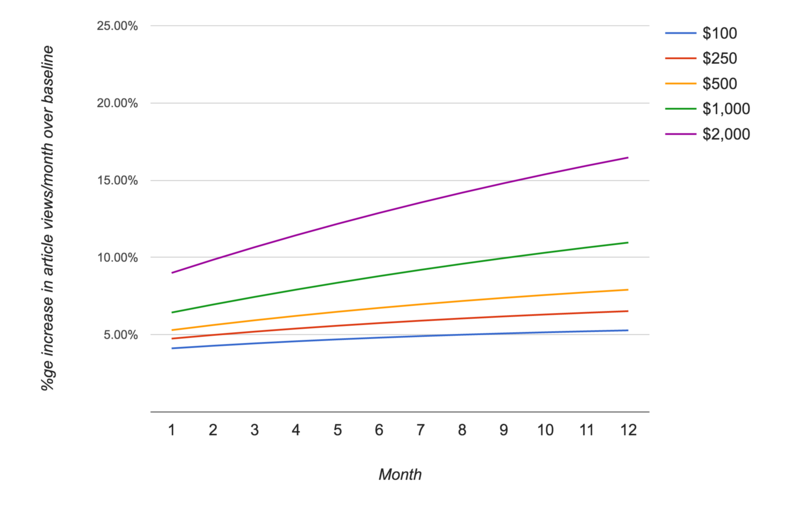 For example, $2,000 per month yields >20% increase in readership. Certainly, if we look at how collaborative filtering is used by TrendMD to target readers, we can see that an increased spend will provide additional data for the collaborative filtering, build a clearer picture of which readers will find which articles of interest across the network. So, for example, Reader A has a particular reading history. Reader A is sent to Publisher X’s site by a TrendMD link appearing on Publisher Y. Reader later returns to Publisher X’s site ( within 30 days) and views other articles. TrendMD’s collaborative filtering is able to build a picture of which articles are likely to be of most interest to readers with similar histories to Reader A, and can target across the network on that basis, preferentially showing Publisher X content to readers with reading histories similar to that of Reader A. The higher the marketing spend on TrendMD, the more incoming visitor data there is to drive the collaborative filtering algorithm, and the more effectively TrendMD can optimize the placement of external links, in order to bring better-targeted visitors, to whom the site is of more interest, and so who are proportionately more likely to return. For lower marketing spends, the smaller number of external visitors means that it takes TrendMD longer to optimize recommendations through collaborative filtering, and so at any given point in time, the incoming visitors will not be quite as well-targeted and “sticky” as in the higher-spend scenario. A key message from these data is that a publisher’s spend on marketing via TrendMD is an investment which pays off increasingly over time, and helps to build a sustained increase in audience. The more traffic which comes through the TrendMD channel, the more optimized the channel becomes for delivering precisely the right target audience - users who will go on to be repeat visitors to the publishers’ content. To find out more about how TrendMD is helping scholarly publishers to increase engagement with their existing readership, while also attracting a new audience, please contact us.